Several of us in the engineering "pit" at PatientsLikeMe have eschewed the traditional desk and chair work setup. At this point a couple of us are on big rubber balls, and four of us are at standing desks. One lucky guy even has a standing desk with an electric motor that raises and lowers his work surface, so he can sit when he gets really tired. 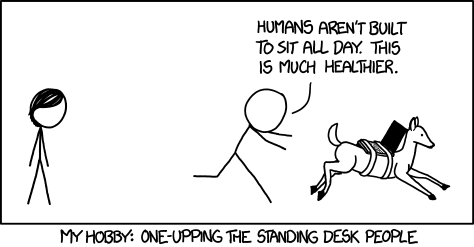 As for myself, I had a standing desk at my last job. Well really it was a regular desk with a stack of books on top. So when I came here, nearly two years ago, and I had the opportunity to get a real standing desk, I jumped on it! Well, not literally, that would be dangerous. But by now I've can say I've been happily standing and working for several years. I looked at treadmill desks, but they were expensive, and my co-workers seemed concerned that they would be noisy. But I figured there had to be some solution. Maybe I could wear roller skates and skate in place all day while I worked? That seemed impractical. Maybe someone made a tiny, quiet treadmill I could use with my existing standing desk? It turned out, not quite. But there was something close: a miniature elliptical runner with no "arms," the Stamina InMotion Compact Strider. $100 on Amazon, with great, if not all that many, reviews. I decided to give it a try. I bought it on my phone, from my bed, at a bit after midnight. A certain insomnia medication that I might possibly have taken may or may not have served to dampen any reservations I might have had about making this particular purchase. At this point I've been using it for a few days, and while my legs are a bit sore, I have to say that I'm pretty happy with it. Despite a slight periodic change in altitude, it isn't to hard to keep my balance and keep my fingers on the keyboard. I'm "walking" backwards as I type this. It's pretty quiet, but if anything gets below the wheels it makes a squeaking noise, so I have to clean it off now and then. I move pretty slowly, about the pace of a nice casual walk. Sometimes I'll kick it up while I'm waiting for rake task to complete or something. And sometimes I'll just stop moving without even realizing it when I'm thinking hard. Unlike a treadmill, it doesn't force me to keep moving. I do get some looks and questions from my co-workers. Often people can't even see the elliptical runner, so they just ask me if I've gotten taller. A few brave people have climbed up and tried it. So far it is seems to be just an office curiosity, but I'm hoping some day it will be a trend. I'm not certain my fellow engineers will be able to keep up with me, but it shouldn't really be all that hard. Despite all this running I'm not really going anywhere. I'm not really sure where I can go from here, but there's always XKCD for further inspiration if I get tired of this setup. * Okay, technically the machairodus kabir was extinct before humans arrived, but once I found it, it was just too cool not to mention.